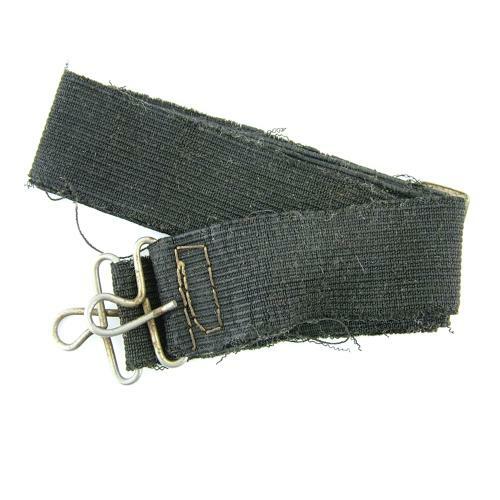 Black elastic strap with metal attachment clips at each end. These were fitted to the Irvin using the small brass 'eyes' sewn onto the rear of the collar. Often referred to as spare goggle straps but were in fact used to help pull the collar into the upright 'stand' position. The elastic is quite worn and stretched with frayed edges. Both connectors are good but the adjuster slide has minor surface corrosion. Fair condition only. Remarkably difficult to find. Beware of copies! Stock code J23322.